Its new but doesn't have ink. Print wirelessly from your smart devices with the cloud connected CanonPIXMA MG3650 All-in-One Wireless Inkjet Printer. Easily connect to cloud storage with PIXMA Cloud Link and conveniently print from and scan to your smartphone or tablet. Canon Pixma MG3051 Refurbished NO INKS. PIXMA MG3051. This Canon PIXMA printer is available in a classic white finish. Print in full colour or mono, with customisable printing options. The printer is compatible with glossy photo paper to create lab-quality photos. Canon PIXMA MG3650 All-in-One Colour Printer. 1, is a one-stop platform that combines all software currently available for Canon PIXMA printers through a single, easy-to-use interface. The images can then be edited and printed through My Image Garden. Canon Pixma MG5750 All-in-one Colour Inkjet Printer Black. Hardly Used. Will also throw in a full ink colour cartridge set for free. PIXMA Cloud Link enables you to browse and print your favourite photos directly to the printer from online albums at CANON iMAGE GATEWAY and Google’s Picasa. For ultimate flexibility, it’s possible to print from and even scan to your smartphone and tablet, around the house, using Canon’s Easy-PhotoPrint app. Canon PIXMA MG3250 All-in-One Inkjet Printer. Condition is Used. Collection in person only. All ink cartridges included. Used to print ONE document. Selling on quickly as requirements have changed and inherited a much larger mains printer. Collection Belsize Park. Compact and advanced all-in-one wireless printer with copy and scan functions,auto duplex,colour screen and wi-fi. Wireless printing. Scan resolution 1200 x 2400 dpi. Print speeds 9.9 black/colour 5.7. No software/drivers, but the latest ones can be downloaded from the Canon website. Tested and in full working order. Canon Pixma Mg3050 All in One Printer 1346c008 without ink. Dispatched with eBay delivery – Shutl 1 day. Canon PIXMA MG6450 All-in-One Inkjet Printer. Condition is Used. User-friendly printing. - Helpful features for editing and printing with ease. - High quality ink is perfect for printing photos. 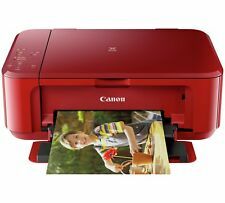 Canon PIXMA MG3650 All-in-One Wireless Inkjet Printer. Condition is Used. Dispatched with eBay delivery – Shutl 1 day. The high performance Canon PIXMA MG7550 All-in-One Wireless Inkjet Printer knows how to satisfy by producing professional prints via smart printing from WiFi and cloud connectivity. Canon Pixma MG7550 All-in-One Wireless Inkjet Printer - White, Black. Fast print speed of 8 ipm mono, 4 ipm colour. Brand new - cables, CD and instruction manual all included - not in original box. Cannon Pixma Mg3550 Printer.wireless printer, no original box but will come with new inks, disc for the computer software and some instructions. I have taken out old ink cartridges because the had ran/dryed out and didnt want to open the new ones to test it. Has a couple of marks on the top but otherwise in good condition Condition is Used. Canon PIXMA MG3250 All-in-One Inkjet Printer. Condition is Used. Dispatched with eBay delivery – Shutl 1 day. Only have the power lead and usb cable now, not sure where the box is anymore. Now i have been self employed for a year or so i have not used this at all. Canon PIXMA MG3650 All-in-One Colour Printer (Print, Scan, Copy, Wi-Fi and Auto Duplex). PIXMA MG3650 All-In-One. 1, is a one-stop platform that combines all software currently available for Canon PIXMA printers through a single, easy-to-use interface. Canon Pixma MG5750 All-in-one Colour Inkjet Printer Black. All printer are from high street store clearance and ex display in stores.The may come with or without ink. All printer are in prestine conditions. CANON PIXMA MG5750 All-in-One Wireless Inkjet Printer. Experience wireless, convenient printing and scanning with the CanonPIXMA MG5750 All-in-One Wireless Inkjet Printer. Technical specifications for CANON PIXMA MG5750 All-in-One Wireless Inkjet Printer. Canon Pixma MG3650 All-in-One red. Very good condition, it was used few times, less than 1 year old. Condition is Used. Dispatched with eBay delivery – Shutl 1 day. Experience wireless, convenient printing and scanning with the Canon PIXMA MG5750 All-in-One Wireless Inkjet Printer. A PIXMA Cloud Link also allows you to print and scan from wherever you are, helping to make your life even easier. Create high quality prints from your computer, tablet and smartphone with the Canon PIXMA MG6851 All-in-One Wireless Inkjet Printer. Apple AirPrint and Google Cloud Print compatibility makes it simple to print from smartphones and tablets. Canon PIXMA MG2550S Printer Copier Scanner. Take a more detailed look into the Canon PIXMA MG2550S. Find out more about the Canon PIXMA MG2550S, its features and what it can do. • Canon MG2550s Black Printer. PRINTER IS IN MINT CONDITION ONLY HAD LIGHT USE. SORRY NO BUY NOW. 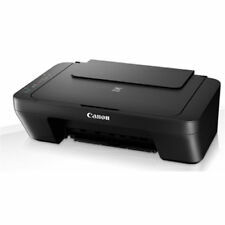 02 CANON Pixma MG3051 All in One WIRELESS PRINTER SCANNER COPIER . Dispatched with eBay delivery – Shutl 1 day. Canon PIXMA MG3650 - multifunctionals (Inkjet, 1200 x 2400 DPI, A4, 216 x 297 mm, Colour, Colour). Series MG3650. PIXMA MG3650 All-In-One. Internet printing with PIXMA Cloud Link including Google Cloud Print. printer canon pixma Mg5350. Condition is Used. The 8 ppm printing speed provided by this black & white model makes it easy to complete any printing jobs with efficiency. It is capable to network with various devices through a Wireless, USB connections. Good condition. Works well, no problems. Basically new. Opened and set up but never used due to this model not having air drop. Comes with brand new installed colour and black ink cartridges.